By all accounts, Rob Scuderi wasn't what Ray Shero was hoping for last season when he signed him to a 4 year, $13.5 million contract. It's arguable that the Scuderi contract was the one mistake that pushed Shero over the edge and out of a job. It wasn't realistic to expect the same player who left Pittsburgh for Los Angeles just four years prior, but even reasonable expectations were much higher than what Scuderi was able to produce on the ice. In order to see what went wrong for Scuderi last year, and to figure out how to best utilize him moving forward, it's helpful to look at how the LA Kings deployed Scuderi during his four seasons there. The Kings paired Scuderi with either Jack Johnson, Drew Doughty, or Slava Voynov 85.2% of the time he took the ice, including 93.9% of the time his last two seasons in Los Angeles. 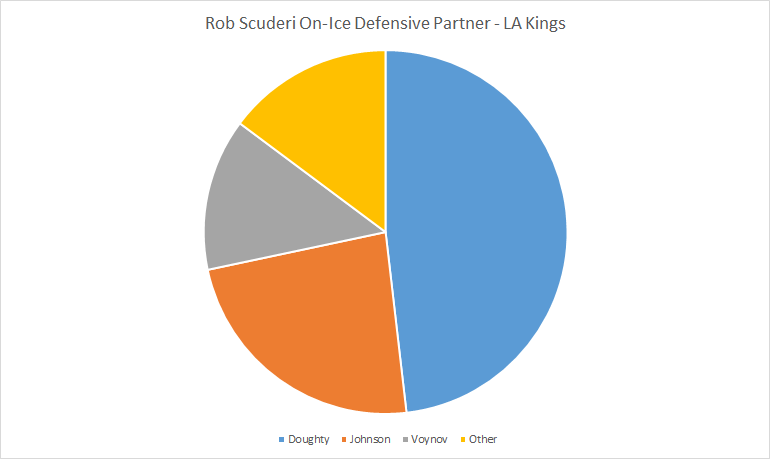 The possession results were mixed (53.3 CF% with Doughty, 50.7 CF% with Voynov, 45.9 CF% with Johnson), but the Kings made an effort to make sure Scuderi took the ice with a mobile, offensively-minded defensive partner, and with a talented and well-rounded player LA was able to more effectively mask his deficiencies. Last season with the Penguins Scuderi only took the ice with a mobile, offensively minded defensive partner (Niskanen, Letang, Maatta, Despres, Martin) 63.7% of the time. Paul Martin would be the player most likely to have a Drew Doughty or Slava Voynov type effect on Scuderi, yet the two only played together for 11.5 minutes total throughout the season. Niskanen, while not the same caliber of player as Doughty/Voynov yet similarly balanced, and Letang, better offensively than Johnson but with similar lapses in his own zone, were Scuderi's most common defensive partners last season, and the results were similar to what was seen with the Kings. Rob Scuderi actually posted a positive CF% while paired with Matt Niskanen (51.9%) while playing more with him than any other defenseman (28.7% of his TOI). With Letang, however, he saw his possession numbers drop back into negative numbers, and the two posted a 43.5 CF% while on the ice together. Making matters worse last season was Dan Bylsma's decision to give Scuderi substantial chunks of minutes with similar types of players who were neither good possession players nor offensively talented. Last season Bylsma played Scuderi with either Bortuzzo, Engelland, or Orpik an astounding 42.4% of the time last season, and the possession numbers speak for themselves. While paired on the ice together Scuderi posted a 35.5 CF% with Bortuzzo, 42.6 CF% with Engelland, and 29.0 CF% with Brooks Orpik. The Kings were able to hide Scuderi's possession deficiencies through their usage of him, yet the Penguins last season put him in position to highlight his faults. Rob Scuderi suffered a broken ankle in just the 11th game of the season last year, and after surgery and a comeback in late December it was clear that he wasn't the same player after coming back, and he was never able to recover. For a player who already wasn't a mobile skater the injury further cut down on his range and limited his effectiveness. He had trouble with his gap control and was routinely abused on zone entries and in transition, issues that were further amplified when he wasn't paired with a mobile defenseman. With an offseason to rest and rehab back to the level he wasn't able to ever recover to during the season it's possible that Scuderi's skating will rebound to where it was pre-injury. It goes without saying that any system will look better with more talented players, but Dan Bylsma's system was a poor fit for Rob Scuderi. The insistence on having the forwards get up ice quickly often left the defensemen isolated from the forwards, and Scuderi being both a poor puck handler and passer meant it was easier for forecheckers to pressure him and more difficult for him to successfully get rid of the puck when they did. Having the defensemen support each other on puck retrievals meant Scuderi needed to be able to cover more ground, something he especially struggled with after the ankle injury. Mike Johnston will be coming into Pittsburgh and installing his own coaching philosophies, but hopefully among the changes he makes is installing a more structured breakout that provides better puck support for the defensemen. While getting the puck up ice and into the other team's zone is a great idea in theory, selling out with the forwards racing up ice is a very high risk, high reward strategy that isn't necessarily the most effective method. By bringing the forwards closer to their own zone the defense will have shorter passes to make and the forwards will also be in a better position to jump back into the play if the puck gets turned over. Rob Scuderi doesn't have the skill set or talent to be able to stand out on his own, bu that doesn't mean that he can't be used effectively when he's out on the ice. Paul Martin has been a great calming influence on Brooks Orpik the past few seasons and has helped Orpik play some of his best hockey even as his play has deteriorated. Martin also would be the defenseman most able to play a similar role for Scuderi as to what Doughty and Voynov provided him in Los Angeles, By pairing Martin and Scuderi together the Pens could most effectively hide Scuderi's deficiencies while still providing decent possession between the two of them. This is especially true if a large portion of Scuderi's troubles were a result of not fully recovering from ankle surgery. 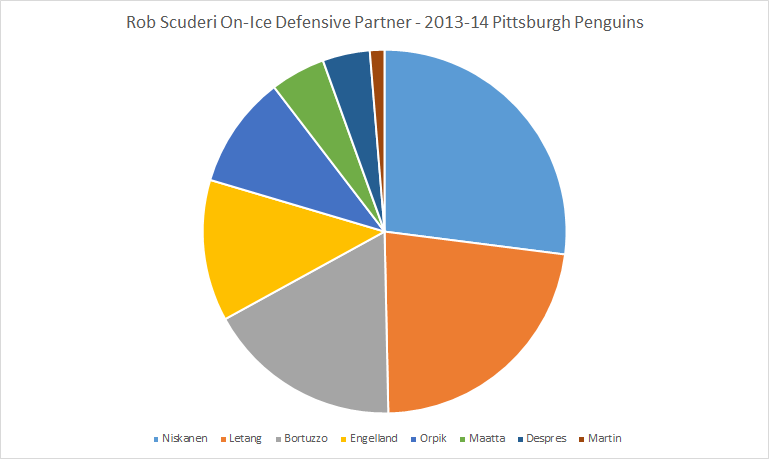 And if not Martin, Scuderi needs to play with Ehrhoff or Letang. The Penguins have good collection of mobile, offensively-minded defensemen and are in a unique position to be able to duplicate some of what the Kings did with Scuderi while he was in Los Angeles. There's no excuse for Scuderi to be playing without one of the offensively skilled players and there's absolutely no reason for him to see anywhere close to the 42.4% of the time he got last season partnered with a player with similar mobility issues. The Los Angeles Kings figured out how to make it work; it's time for the Pittsburgh Penguins to do so as well.